The T-shaped leadership model continues to be relevant in a time of unprecedented disruption. Without a doubt, new technologies have created new challenges for businesses. The digital revolution remains well underway, with emerging technologies disrupting almost every industry on earth and making external operating environments ever more complex. Customers are more knowledgeable and powerful. New competitors emerge every day, changing the game faster and in unpredictable ways. While we work to develop leaders who can adapt to this new market reality, Paul Roehrig’s recent article (Dialogue, Q4 2017, page 30) showed how technology, AI specifically, is rapidly changing organizations. Artificial intelligence includes a vast range of technologies, from neural networks to minibots. As such, it holds tremendous potential for change. Neuroscientist Dr Vivienne Ming characterizes two vectors of change. First, a scenario in which AI makes us smarter, safer, healthier. We’ll have greater access to knowledge, faster; can build machines to do inherently risky tasks; and we’ll reap the benefits of gigantic leaps in diagnostic and preventative healthcare. Ming calls this the “for 120% of the cost we get 200% of the value” scenario. A second scenario will unfold simultaneously, one where Ming points out: “If you are doing the same job you were doing a week ago, someone like me is going to automate it.” Leaps in efficiency and data proliferation, coupled with machine learning, will enable organizations to automate a wide range of tasks, even those currently done by ‘experts’. As Ming cites, up to 40% of a chief executive’s job can be automated. In this scenario “we get 80% of the value for 20% of the cost”. But where are the signposts for leaders of organizations where job titles might include things like carbon farmers and 3D-printing engineers? Roehrig’s view about what’s going to be most important is instructive. The things we do naturally – the very human traits such as leading, the ability to engage with others, asking questions, interpreting, applying judgment, showing curiosity and creativity – will dramatically increase in importance. Ming’s view, put so well in her bold keynote presentation at our recent conference (see page 50), asserts that while even complex tasks once performed by experts will be done better by machines, “only one job description for the future matters – creative, adaptive problem-solver”. Applying the human touch, empathy, curiosity, and creative problem-solving reminds me of the ‘T-Shaped Leader’, as first coined some years back by chief executive Tim Brown from IDEO, a firm well known for its human-centred innovation work. The vertical stroke of the ‘T’ is a depth of skill in business or technical specialization that allows people to contribute to the creative process because of what they know (see left). The horizontal stroke refers to the breadth of understanding across the business, and having a disposition for collaboration across disciplines. 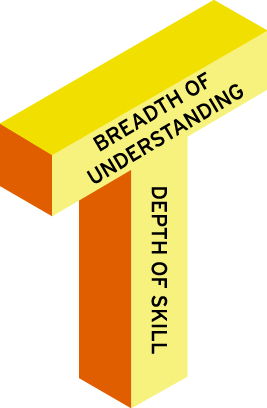 T-shaped leaders bring depth of knowledge and breadth of understanding. In coming years, the depth on the vertical portion of the ‘T’ might shift from years of accumulated wisdom in a single discipline, to the ability to access, interpret and contextualize insights provided by machines. The top of the ‘T’ will merit a more prominent position because there will be a premium on leaders who have more of these creative, adaptive, problem-solving skills. The big management idea associated with the First Industrial Revolution was to bring scientific principles to management. We have come full circle. In this Fourth Industrial Revolution, we must now accentuate what is uniquely human. – Michael Canning is global head of new businesses at Duke Corporate Education.